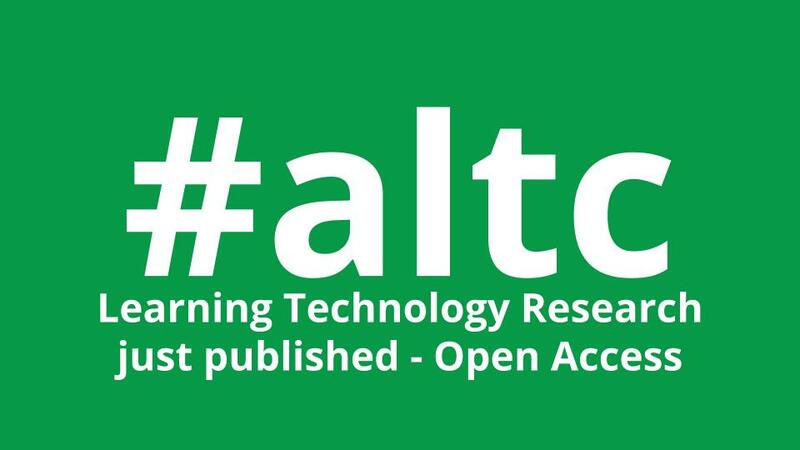 ALT welcomes new Editors for Research in Learning Technology! We are delighted to welcome new Editors to the Editorial Team for Research in Learning Technology. Led by Vice-Chair of ALT, Nicola Whitton, last year's open call for expressions of interest and subsequent recruitment and selection process has led to the following appointments: Liz Bennett, Michael Flavin, Sarah Honeychurch and Simon Thomson will join the Editorial Team as Editors alongside Lesley Diack, Fiona Smart, Peter Reed and Gail Wilson. You can find more information about the Editorial Team here. Amanda Jefferies meanwhile is coming to the end of her term and was recognised for her significant contribution and service to the journal at ALT's AGM in September. We are also pleased to announce that Chris Rowell, who is already on of the editors of the #altc blog, is also joining the Editorial Team to help establish a new liaison editorial role between journal and blog whilst Michael Thomas will be joining the Editorial Board providing strategic input to the development of international research partnerships. The Trustees of ALT congratulate all new appointments and extend a very warm welcome to all! Dr Liz Bennett is Director of Teaching and Learning in the School of Education and Professional Development at the University of Huddersfield.Her most recent work was funded by a Scoping Award from the Society for Research in Learning Technology, SRHE, for a project titled “Students’ learning responses learning analytics dashboards “ and has also published in the field of higher education practices and learning technology. She is committed to ensuring that learning technology as a field is informed by values of equality, openness and social justice and is excited to take on join as one of the Editors of the ALT’s journal Research in Learning Technology. Michael Flavin is an academic at King’s College London. He holds a degree, three master’s degrees and two doctorates. His main research interest is in technology enhanced learning from the perspective of Disruptive Innovation. His most recent book is Disruptive Technology Enhanced Learning (Palgrave Macmillan, 2017). He has published in a range of journals, including the Oxford Review of Economic Policy, Arts and Humanities in Higher Education, and Research in Learning Technology. His previous publications include two books on nineteenth-century literature. He is a Senior Fellow of the Higher Education Academy. Sarah Honeychurch is Fellow - Teaching Excellence Initiative in Business School Learning and Teaching (Adam Smith Business School) at the University of Glasgow. Sarah's first area of educational research was co-operative and collaborative learning, specifically the Jigsaw Classroom. With the support of a grant from the HEA Sarah developed a model of this specifically for seminars and tutorials at the University of Glasgow, and continues to use this model in her own teaching and to provide advice for others interested in using it. Along with colleagues in LEADS Sarah has developed a model of virtual peer assisted learning (VPAL) which is used across the College of Science and Engineering to help subject year groups to form learning communities and support each other in their learning. Sarah's current PhD research also recognises the importance for learning of peer interaction and peer support, and looks at afinity spaces (James Paul Gee) and participatory culture (Henry Jenkins) in online communities. I am a Academic Developer in Digital Enhanced Learning at London South Bank University. Previously I was Learning Technology Manager at Regent’s University in London, a Lecturer in Economics (1990- 2005) and a Lecturer in Education (2005-2010) at University Centre Croydon. My research interests are all things to do with Technology Enhanced Learning (TEL). More specifically the use and evaluation of social media by staff and students in Higher Education and I am doing a Doctorate in Education at the Institute of Education, UCL. Currently, I am an editor of the Association for Learning Technology’s (ALT) blog. Previously I have been a member of the Staff and Educational Development Association’s (SEDA) National Executive (2015-10) and Conference Committee (2010-1015) and founding member SEDA’s Special Interest Group on Technology-Enhanced Practice. I am also a Certified Member of the Association for Learning Technology (CMALT). I live in Camberwell and I’m interested in things to do with cycling, photography, travel, politics and London. Simon Thomson is a "flipped academic" (Bruton, 2012) and has a track record for developing and supporting digital pedagogic practice in Higher Education. His academic career has been entirely focussed on teaching excellence and his work is dedicated to improving the staff and student experience. He has led on a number of funded learning & teaching research projects including a JISC/HEA funded OER project as part of the Phase 1 UKOER programme, an institution-wide pilot of tablet devices evaluating the impact of 1to1 tablet device use and more recently a HEFCE funded project exploring the next generation of digital learning environments. He has presented and published his work at a number of national and international conferences, predominantly in the areas of digital pedagogy, learning technology and open education. A passionate advocate of open education almost all of his work is available under a creative commons license (where he is permitted to do so). He is currently Director of the Centre for Innovation in Education (CIE) at the University of Liverpool where he is responsible for leading the centre in supporting innovation in learning, teaching and assessment through enhanced curriculum development. Simon was awarded an HEA National Teaching Fellow in 2014 . He is also a Senior Fellow of the Higher Education Academy, SEDA accredited in Embedding Learning Technologies and an Apple Distinguished Educator.